YourSpeedTestCenter.com – How to remove? 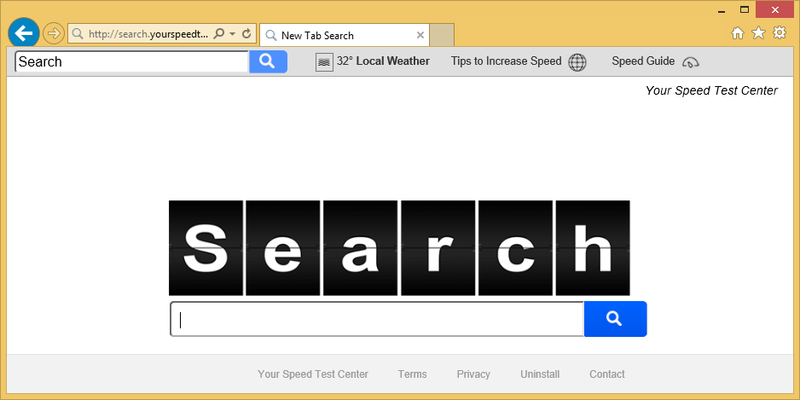 YourSpeedTestCenter.com is a browser hijacker, capable of altering your browser’s settings. It will appear suddenly on your computer so you might believe that you have infected your computer with a malicious virus, but that is not the case. yourspeedtestcenter.com cannot enter your computer without your permission. It’s installs along with some freeware you are installing, but it does that without your knowledge. yourspeedtestcenter.com is not malicious, even though many users would disagree. Having said that, it can indirectly expose you to questionable content, which in turn could lead to a malware infection. It’s not recommended that you allow this hijacker to stay on your computer. Remove yourspeedtestcenter.com and you can browse the Internet as usual. Why should you delete YourSpeedTestCenter.com? Like we said before, yourspeedtestcenter.com installed along with some sort of freeware. This happened because when you were installing it, you did not deselect the added items. Nowadays, freeware usually has something attached to it, and unless you manually deselect it, it will install automatically. If you choose Default settings, you will not even be aware of the added items. This is why you need to start opting for Advanced (Custom) settings. When you select them, a list of additional items will appear and you can deselect them. After you have done that, you can continue to install freeware. Having to uninstall yourspeedtestcenter.com or similar can be rather frustrating, so if you want to save the effort, take our advise. When you open your browser (be it Internet Explorer, Google Chrome or Mozilla Firefox) you will notice that yourspeedtestcenter.com has set a new homepage, new tabs and search engine. You might not be allowed to change the settings back, unless you first delete yourspeedtestcenter.com from your computer. The website itself looks much like a legitimate search engine would look like, it’s very simple and has a search bar in the middle. If you were to use it, you might think that your results are generated by Yahoo but if you look closer, you would notice that it says Genieo Yahoo. This means that your results will be filled with sponsored results. This is a very good way for the hijacker to redirect you. And that is its main purpose. We recommend you do not click on any of those results because you might be taken to weird websites. In some cases, you could even be taken to dubious websites where you could end up downloading malware. You should remove yourspeedtestcenter.com. Depending on how experienced with computers you are, you can either uninstall yourspeedtestcenter.com manually or automatically. Manual yourspeedtestcenter.com removal can be a bit more complex because you will need to locate and erase yourspeedtestcenter.com yourself. If you do not think you could do that, use a reliable removal tool to eliminate yourspeedtestcenter.com.